Brood II cicadas get busy in Staten Island after spending 17 years waiting for their chance to mate. The march of the cicadas is hitting prime time on the East Coast, and that means researchers are getting their best opportunities to study how the burrowing insects have weathered the past 17 years. They're finding some amazing comebacks, and some puzzling absences as well. Over the past few weeks, billions of cicadas have been rising out of the ground, over a swath of territory ranging from Georgia to Connecticut. These bugs are part of a group known as Brood II, which emerges every 17 years to crawl and fly, mate and die over the course of just a few weeks. Between one emergence and the next, the immature bugs are dug into the soil, living off the watery fluid in plant roots. The pace of the emergence is dictated by soil temperature: This year's cicada outbreak has been a bit slower than expected, due to a cooler-than-usual spring. But University of Maryland entomologist Michael Raupp says the conditions now appear to be right for cicadas to make their appearance across most of Brood II's traditional territory. Magicicada.org's map of cicada sightings points to hot spots in Virginia, Maryland, New York, New Jersey, Pennsylvania, Connecticut and Rhode Island. For residents in those states, this may be as good as it gets. "If they don't have 'em now, they're going to be in for a very bad case of cicada envy," Raupp joked. And then there's the denouement. "We're starting to see the first dropouts," Raupp said. "They've completed the biological imperative in the tree canopy, and we're starting to see mortality." Magicicada.org's map shows where cicada sightings have been reported. Take a closer look at the curious 17-year life of the flying bug as the East Coast weathers an invasion. If you're expecting to see cicadas all over the place, you'll be disappointed. "These things are very, very patchily distributed," Raupp said. "You can go a distance as little as a quarter-mile or a half-mile, and one location will have thousands or tens of thousands of cicadas in the treetops, and the other location will have nothing." If you come across a bug infestation, be not afraid. Cicadas are not harmful to humans. Some folks may find them disgusting, but others find them delicious. The signs of emergence have been seen in some surprising locations. "Cicada cells are very airtight, as they survived Hurricane Sandy in Staten Island," Elias Bonaros reported on the Entomology-Cicadidae discussion forum. "I found loads of exit holes right where the sea met the shore and were supposedly submerged under many feet of water!" That resilience is in line with reports going back almost two centuries. In his classic work, "The Periodical Cicada," entomologist C.L. Marlatt mentions a case where a "gentleman in Louisiana" dammed up some property in 1818, covering the soil with 6 feet (2 meters) of water. When the water was drained away more than a year later, cicadas were found "in a fine, healthy state, ready to make their appearance above ground, that being the year of their regular appearance." Other changes wrought by humans can be more injurious to the cicadas. "The most damaging of all perturbations would be the creation of hardscape," Raupp said. "When that happens, it's devastating to the cicada population. For example, what was a cornfield 17 years ago, that has now been regraded to be a condominium or townhouse complex. Any disturbance of 60 centimeters [2 feet in depth] is going to extirpate any cicadas in that area." Some bug-watchers are already coming across problem areas. 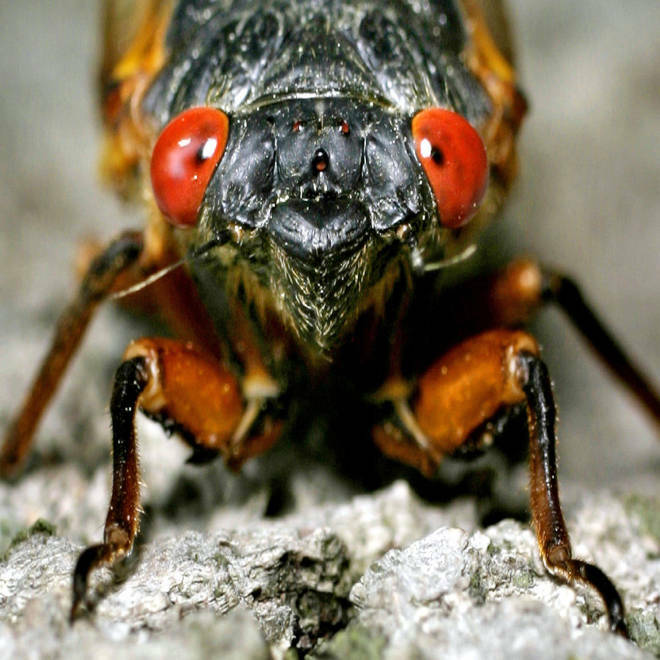 John Cooley, a cicada expert from the University of Connecticut, said there are some "surprisingly silent" patches of land in Virginia where Brood II was expected to emerge. "We're not sure what explains these absences — the woods look perfectly fine for periodical cicadas," he wrote on the Entomology-Cicadidae forum. Have you experienced the emergence? Or have you missed the bug-out? Either way, feel free to weigh in with your comments below. Watch Samuel Orr's documentary, "Return of the Cicadas," from motionkicker on Vimeo. Orr is seeking to raise funds via Kickstarter for an extended version of the documentary, intended for airing on public TV.